weld two metal plates together 2枚の金属板を溶接する. weld a piece of metal to a pipe 金属片をパイプに溶接する. They were welded together in friendship. 彼らは友情によって固く結ばれていた. Several incidents have been welded into a single narrative. いくつかの出来事が一つの物語に統合されている. These alloys weld at different heats. これらの合金はそれぞれ異なった熱度で溶接される. I seem to have cut weld at all stages of flowering. From Middle English welde, wolde, from 古期英語 *wielde, *weald, from Proto-Germanic *walþijō, *walþō (compare Dutch wouw, Middle Low German walde, wolde, gaude in French), from Proto-Germanic *walþuz (“forest”). More at wold. A herb (Reseda luteola) related to mignonette, growing in Europe, and to some extent in America, used to make a yellow dye. The yellow coloring matter or dye extracted from this plant. (transitive) To bind together inseparably; to unite closely or intimately. Now should men see / Two women faster welded in one love / Than pairs of wedlock. 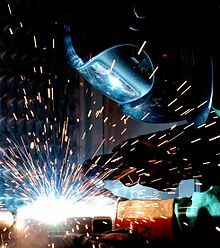 (transitive) To join two materials (especially two metals) together by applying heat, pressure and filler, either separately or in any combination. The state of being welded. The joint made by welding. [Arthur says to conquering knights] "ye be worthy to welde all your honour and worship"